I’m not one to buy into a publisher’s hype, but when Portal Games described developing Tides of Time as “landing a Boeing 747 in a phone booth,” they caught my attention. Portal is best known for its immersive games like Robinson Crusoe, so I was curious to see what they’d do — and how they’d do — with a microgame. I preordered a copy for pickup at Gen Con. Ignacy Trzewiczek himself was demoing the game when I went by the booth, so I tried a hand with him and then went off to give it a full play through with a friend. My friend and I played four times in a row, and I’ve played a number of times since. Others seem to have enjoyed the game as well: it sold out at Gen Con, and it was hovering in the 20-30 range on the BGG Geekbuzz list. 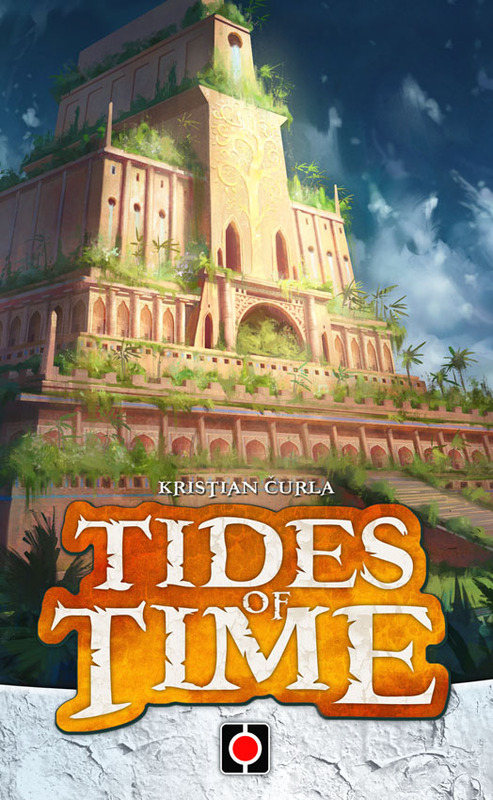 Tides of time consists of three rounds in which players draft cards to build their kingdoms. The goal is to have most victory points at the end of three rounds. The game is centered on just 18 game cards. All cards have an ability, and in most cases that ability is a scoring objective. 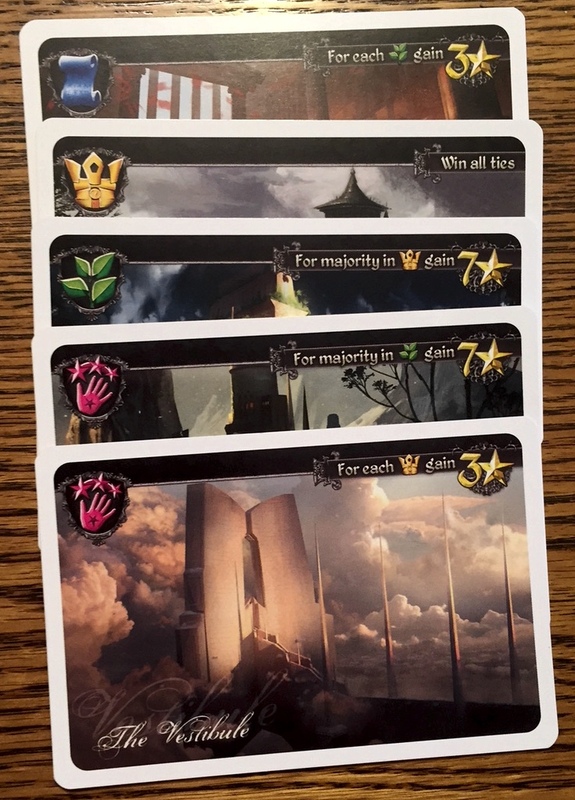 Fifteen cards have a suit: three each in Palaces (yellow crowns), Libraries (blue scrolls), Gardens (green leaves), Temples (purple hands), and Strongholds (red towers). Each player takes five cards at the start of the game, and the remaining eight cards are set aside as a draw pile. Players take turns drafting the cards, playing them face up on the table simultaneously after they are selected and then handing their opponent the remaining cards. Once each player has drafted five, the round ends, and scoring occurs. Scoring is controlled by the ability of the cards. The topmost card gives three points per Garden, and this player has one, so he gets three points. The third card gives seven points if the player has the most Palaces. Since this player has one Palace and wins all ties (per the second card), if his opponent has one or fewer Palaces, then this player gets seven points. The same is true of the fourth card down: this player has one Garden and wins all ties (per the second card), so if his opponent has one or fewer Gardens, then this player gets seven points. Lastly, this player gets three points per Palace, and he has one, so he gets three points. Thus, his first round score is probably 20, depending on what his opponent has showing. This would get noted on the score pad with the pencil that comes with the game. Before the start of the next round (but after victory points are calculated), players choose one of the cards to keep and put one of the Relic of the Past tokens on it (see above). This card is theirs for the rest of the game, and it will be scored in subsequent rounds. 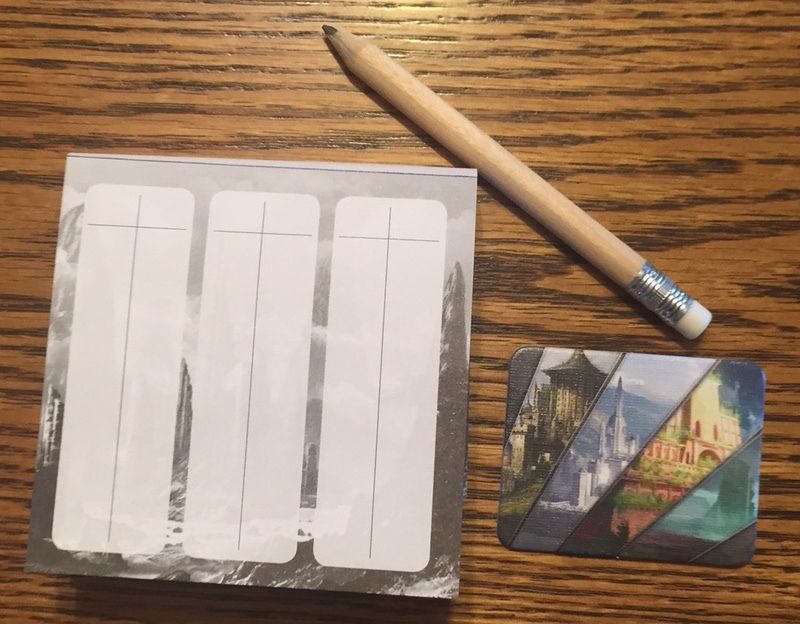 Players also return one card to the box and draw back up to five cards. The second round is then played as normal and scored. This process is repeated for round three, so in round three each player should have two Relics of the Past. The player with the highest score at the end of the third round wins. As I said in my first day overview of Gen Con, Tides of Time is a brilliant card drafting and set collection game packed into just 18 cards. The most striking element of the game is perhaps its artwork. Portal’s games generally have a high presentation value, and Tides of Time is no exception: the artwork is stunning. 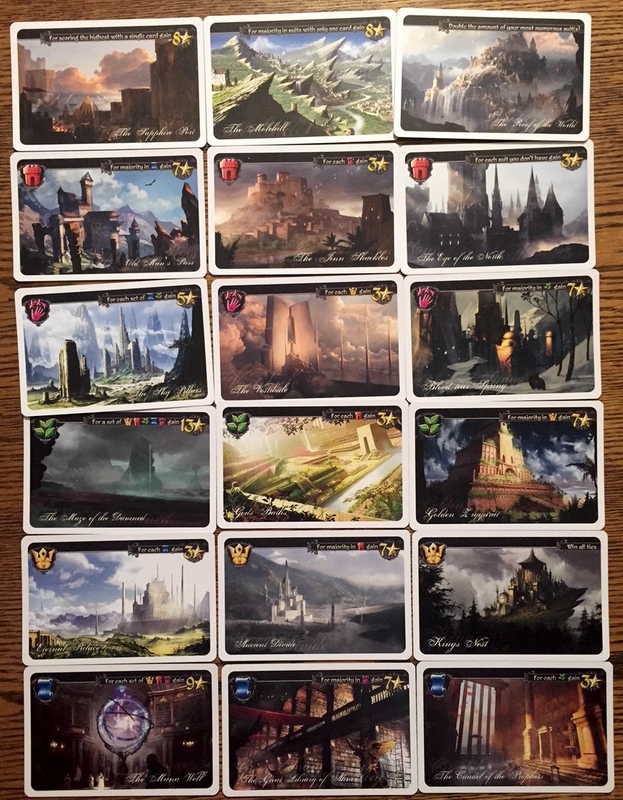 The game is held out as a civilization-building game, and the artwork gives it that feel, even if the theme is pasted on. But Tides of Time is much more than its artwork: the mechanics are clever. The game offers a tense duel between two players, and it reminds me a bit of 7 Wonders. In my mind, the game is an exercise in both psychology and calculation: much of it is anticipating your opponent’s picks (“I want this card, but it is only worth it if I get this card too!”) and evaluating the state of the game table. There are plenty of opportunities for players to block each other’s moves, and as is generally the case with drafting games, sometimes you need to pick the card your opponent needs, not the card you really want. So far, I’ve found that the more experience player has a significant leg up. There is virtually no randomness — all of the cards will be played at some point, it is just a question of when — and most decisions are made knowing exactly what the other player is holding. This does add a memory element to the game (“Did I just hand him a Library?”), but it is manageable. I was initially concerned about replayability. I assumed that with just 18 cards I’d play this game five times and then give it away. I’m over a dozen games in, and I haven’t tired of it yet. I’m sure I eventually will — probably around the 25 game mark — but in the mean time I’m having fun with it. And in the end, 25 plays out of a $12 MSRP game is excellent value. Did Kristian Čurla and Portal manage to land a 747 in a phone booth? Not quite… there isn’t that much depth in this small-box game. But they did manage to make one of my favorite microgames — and two player games — of the year. Lorna: I enjoy this game quite a bit and it is a very good micro design that really makes the draft work for 2 players. The game seems well balanced although I am a little suspicious of one card but time will tell. Khmer is still my favorite of this genre, but if you prefer some kind of theme this game would be my first suggestion.